You will need to clear your flash storage if Omegle buttons or camera doesn’t work on the Omegle. However there can be other issues with your computer. You should try all ways to fix this problem since there can be various reason of this error. 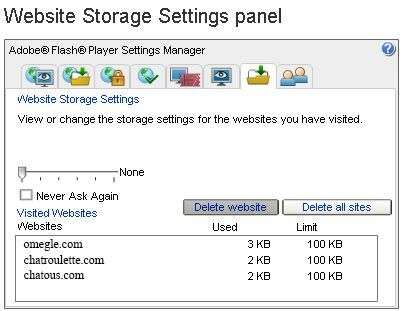 It’s very easy to clear flash storage for the site. It won’t take your seconds to do that. 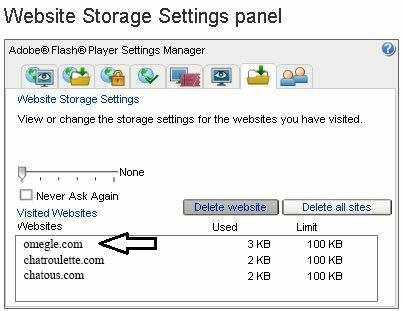 Firstly go to Google and search “How to Clear Flash Storage” or click on the link (which we will give you below) to go to exact web site (Adobe’s official website) instantly. You will see the panel there which will help you to clean your flash storage. We recommend you to clear all but you can clean only Omegle if you want but if the problem occurs because of your storage, may be it won’t help you at all. So clearing all storage is the best idea. Let’s show you how to do that. Click here to go to official Adobe Flash site to clear all datas first. Then you will see a listing on the settings. You will see all flash storage of the sites which you have visted. Click on Omegle.com from the list first. After you selected the site, then click on delete website button. Please don’t play with other settings since you can break your all flash plugin at your computer. You are done, go to omegle and try reconnect to site. Click here to go to Adobe Flash Storage settings again. 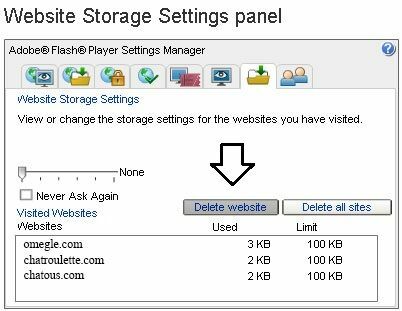 Just click on delete all sites button and clear all flash storage in your computer. Clearing all data from your storage will also fix if you are having trouble with storage problem. We recommend you to delete all sites from the storage if you are facing with Omegle buttons problem and camera problem. You can try fix this problem for Chrome, Firefox and Opera.